We recommend starting your search for your perfect gown around 12 months before your wedding date. However, it is all personal preference – if you would like to be super organized, or struggle with decision making, it is never too early to start looking. Just be aware that dresses do get discontinued from collections twice a year, so if you are shopping early you need to keep this in mind. Ideally, yes. We do advise booking an appointment in advance, where possible, in order to ensure you have your own private changing area and an Amelia’s bridal consultant available to assist you. We will always try our best to accommodate walk-ins, but please be aware we like to keep appointments private. So on busy days, like Saturdays, you may be unable to browse our collections while appointments are taking place. The majority of our dresses take between 20 – 24 weeks to be made and sent to us. Time for alterations and accessory appointments also needs to be considered. What if my wedding is less than six months away? Don’t panic! Here at Amelia’s we have plenty of options for brides with limited time. Most of our designers offer a rush-cut service on certain dress styles, reducing delivery time to 4-10 weeks. Extra charges may apply for quicker deliveries. We also have a sale room full of beautiful ex-sample dresses ranging from size 8 up to 26 which are available to take away on the day of purchase. For current bridal collections, prices start at £599 and range up to £2,397. The majority of our gowns are priced around £1500. Keep an eye out for exclusive offers, upcoming events and sales on our Facebook page. We stock samples from size 8 to size 26. It is more than likely that the dresses you try will not be a perfect fit, but our bridal consultants will try our best to pin the dresses to give you an idea of how the dresses will look. Bridal Consultations – We find that 2 hours is the perfect amount of time to try as many as dresses as you like. This leaves enough time to re-try your favourites with a variety of accessories too. Bridesmaids – 1 hour is generally plenty of time for your bridesmaids to try a variety of our dresses. We will show you all the available colour swatches to help you tie everything together. Menswear – A 1 hour initial appointment is normally recommended for the groom to try different combinations and choose the outfits for everyone in the groom’s party. Further appointments will be arranged from here for measurements to be taken. (1 Measure = 10 minutes approximately). Around one week before the wedding, we will invite the full groom’s party back to try their suits on and make any last minute adjustments. Mother of the Bride/Groom – No appointment required. Simply pop in and browse at your convenience. We have a selection of shoes by Rainbow Club, veils by Joyce Jackson, and tiaras by Amanda Wyatt and Twilight Designs to complete your bridal look while trying on dresses in both of our boutiques. We don’t need you to bring anything, but if you do have any accessories that you will be wearing on the day, please feel free to bring them along with you to check that they match with the dress. If you have a scrapbook full of ideas or a Pinterest board bursting with inspiration, we’d love to see it. Show your bridal consultant all of your ideas and any pictures of dresses you’ve seen and would like to try. This helps our stylists hand-pick gowns for you to try that you may have looked past during your initial gown selection. All we ask is that you try and come with an open mind to your bridal appointment. So many brides come in with a set idea of the dress they are going to pick and leave with a completely different idea. We are here to help and love to hear your ideas and honest opinions. Yes – this should be a memorable day! We want you to be able to remember how you look in your favourite gowns. However, please keep in mind dresses are unlikely to be the perfect fit, and pictures taken in the wrong lighting or from a bad angle can be off-putting. So please take your pictures with a pinch of salt, use them to remind you of details that you love, how the dress made you feel, and how your trusted few reacted. We will always provide you with designer names and styles of your favourite dresses so you are able to leave and look at designer’s images online. What is a designer weekend? Designer weekends are events during which a designer’s most recent collection is previewed. They feature the latest styles not yet available to try in stores and exclusive offers are available upon purchasing. If you find a bridal gown at a designer weekend, be prepared to purchase it before the event ends, as it may no longer be available at the store once the event is over. Are the dresses cut to my exact measurements? Please note that all of our gowns, although cut specifically for your individual order, are still cut in standard sizes. We will match your measurements to our size charts and pick the closest size. They are not made to your exact measurements. This means alterations will almost always be required to get your perfect fit. Alteration charges are additional and will be discussed during your appointment. I’ve found my perfect dress, what happens now? Congratulations! To place your bridal gown order with us all we need from you is to fill out some paperwork. We will take your measurements and advise which size to order. We require a 50% deposit to get your gown ordered, the balance is due upon arrival of your gown at our boutique. As soon as your dress arrives we will give you a call and schedule an accessory appointment. During your accessory appointment you can try tiaras, veils and shoes to complete your look. Any required alterations or adjustments will be discussed during this appointment and further fitting will be booked in accordingly. We also offer payment plans – please call us to discuss this further, we’ll always try our best to work with you. We recommend starting alterations around 8 weeks before your wedding date. Alterations are additional and are carried out by our in-house independent seamstress. You are under no obligation to use our seamstress, and are free to take your gown elsewhere if you wish. 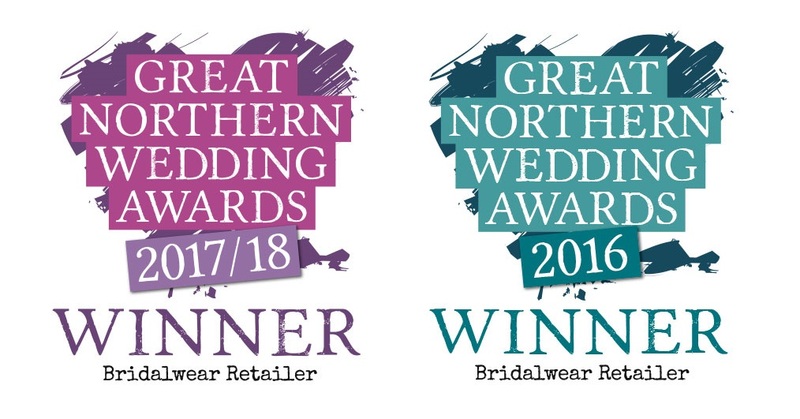 If you take your dress elsewhere for alterations, feel free to pop your dress back to our boutique for your dress to be steamed before the wedding. When should I collect my gown? Most brides choose to pick their bridal gown up the day before the wedding, so they can take it directly to the venue where they will be getting ready in the morning.